Over the next few weeks, the commune grows. Several neighboring animals, hired to help with the construction, like the idea of “A place where anyone can come and live free, be happy, and be safe” (p. 8), and decide to stay. Fespin, a silently enigmatic Blackwood Forest young squirrel, introduces them to unexplored caves beneath them, and to the abandoned stone RockHouse, in strangely good condition. The animals decide to make RockHouse their headquarters. As soon as the commune is larger and well-enough developed, and named Arraborough, Slither brings his wheelchair-bound sister, Narcine, to live there. What the animals do not realize is that (a) the authorities of the nearest city’s Criminal Activity Counter Force, sure that the commune is a cover for a crime scheme of the terrorist Serpent Society, are surreptitiously watching and waiting for an excuse to arrest everyone, and (b) two charismatic new animals, Pimlico Calico and, later, Dovan Dog, both with curiously luminous eyes and patches of blue fur, who quickly become everyone’s friend, have both a secret agenda and unsuspected powers. The Unimaginable Road covers Arraborough’s founding and the first few months of its existence. About twenty residents are featured, and their life stories and secrets are revealed. Many are mundane; some are depressing (Arraborough has been settled by “refugees” from normal animal society), and a few are eerie. Old and maybe senile characters remember Fespin from their youths; he has stayed a strange young squirrel for generations. When others try to take Fespin into the nearest town with them, the terrified young squirrel is literally unable to leave the forest; the vehicle he is in is dragged backwards. A leading character mysteriously disappears. There is a lone headstone engraved in an unknown language. There are cryptic warnings to never go into the caves beneath the forest. Exotic primates arrive. Fespin excitedly insists that a tree tried to kiss him. Someone enters the caves and dies. Well, this first novel is subtitled Arraborough, Book One. 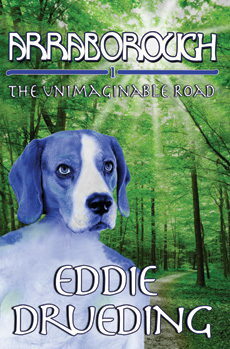 According to the publisher’s website, Drueding “created Arraborough in the summer of 1981 as a comic strip of a blue-eared dog, later elaborating the story into hundreds of comic books, until converting the premise to novels in the 2000's. In its 30th year, the story finally saw print as an e-book published by Melange Books.” (The trade paperback edition is published through Lulu Press.) Melange Books was written up on Flayrah in May 2012 as the first non-furry publishing company to create a “Furry/Anthropomorphic” category among its “Action & Adventure”, “Horror”, “Sci-Fi”, “Women’s Fiction”, “Western”, and other “books by genre”. Despite using animal descriptors constantly, and jarringly referring to their natural ages – a dog is mature at two years old and elderly or dead of old age by fourteen – it is almost impossible to think of these characters as anything but human or comic-book type funny animals. Mammals, reptiles, or avians, they are all the same size. How successfully ‘morphic The Unimaginable Road is will depend on each reader’s personal opinion of what “anthropomorphic fiction” means. I can't comment on the book itself, but ... oh my god, who designed the cover? I don't know what's worse, the typeface that makes the title almost unreadable because all letters look like R, or the photoshop desaster behind it.